Overview (No Spoilers): It wouldn’t be an exaggeration at all to make A Short History of Nearly Everything mandatory for all high school science students to read. Bill Bryson delivers an impressively wide range, e.g., the universe, protons, evolution, plate tectonics, etc., scientific facts in an organized, efficient and concise manner that is amenable and engaging to all ages. Many of a professionally trained scientist lacks Bryson’s ability to communicate intricate and complex concepts in a way that is understood by all. Perhaps more fascinating, Bryson, adds in the history and methods employed by many the scientists behind scientific facts which are now taken for granted. As a chemist, I found the background of the scientists extremely intriguing, especially when considering the names that history made infamous, alongside the numerous, brilliant individuals which science and history consequently forgot. Overall, Bryson succeeded in reinvigorated curiosity and a general amazement in science, and the universe/world/history to a level resembling one of my youth. 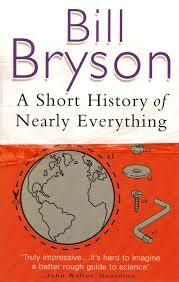 Every person should read A Short History of Nearly Everything at least once, if not twice! I agree that every person should read this book at least once! I would also recommend one of his other books “At Home”. It’s fascinating stuff. Wonderful review, and I agree that every person should read this. I think it would give a lot of people some much needed insight. I’m planning on getting my mom this audiobook for Mother’s Day. 🙂 As a high school science teacher I think she will really enjoy it!